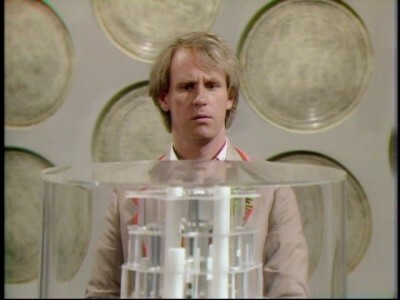 Another short and sweet two part adventure from Peter Davison's tenure as The Doctor, The Awakening is a decent story that's mainly hampered by the short run time. It has a lot going for it though, including some nice locations shots, a nice (for Doctor Who) looking villain, and a cast of supporting characters that really look like they're enjoying themselves. 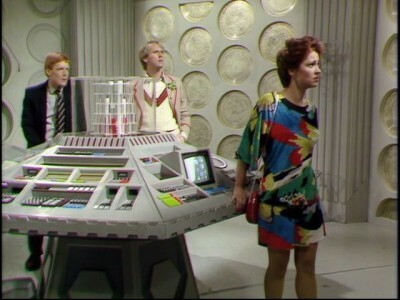 Traveling into the past after dealing with the Silurians in Warriors of the Deep, the Doctor, Turlough, and Tegan decide to pay a visit to Tegan's grandfather in the England of 1984. When they arrive however, something is amiss. He lives in the village of Little Hodcombe where a significant battle was fought during the English civil war way back in 1643, and the town in celebrating the anniversary of the conflict by staging a reenactment. The only thing is that people are taking it way too seriously. Not content to just play soldier, they plan on having a real battle and they're going to kick off the festivities by burning the May Queen at the stake. This is all happening because of the Malus, a demon-like entity that is creating a psychic link between 1984 and 1643. He needs the villagers to slaughter each other for... well, some good reason I'm sure, and it's up to The Doctor to stop it. This story had a lot of potential, and it is pretty good as it stands, but it just falls under the 'average' category. On the plus side are the good costumes and exteriors settings, the BBC certainly knows how to stage authentic looking period pieces. 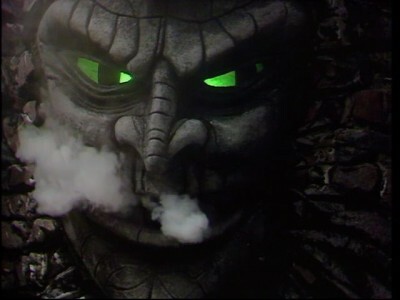 The story also has some nice aspects, including a cool stone face monster that breaths smoke. The main drawback is the short running time. This story was originally intended as a four-part adventure and in cutting it back to half that length a lot of plot holes were created. I never did get a good handle on the Malus and what his intentions were. 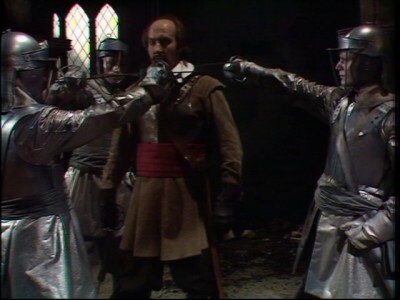 They did make an off-hand remark that he was the spearhead of an invasion, but why wait 350 years to start the plan? Why didn't the original battle fulfill whatever need it had? Oh yeah, and what type of race sends out an immobile soldier to wreak havoc in advance of an invasion? I'm sure these questions (and many, many more) would have been fleshed out if they had a little bit more time. The mono soundtrack is very good. It's clean and clear with no hiss or background noise to take away from the story. The dialog is easy to discern and the background music and effects are never overpowering. Being a mono track, there's really not much more to say about it. The full frame video has been cleaned up by the Restoration Team and looks fine though not stunning. There's only so much you can do with 27 year old video tape. Some scenes are a bit soft, but generally the image is clean and the colors are fine. There is a section where guards with red capes enter a room, and the bright red blooms pretty noticeably. That was the biggest defect however. If you've seen the other restored Davison era stories, then you'll know what to expect. Even with a (arguably) minor two-part story, the BBC has come up with some nice extras. Honestly, no one would have blamed them if they had released this as a bare bones disc, but I'm really glad they went the extra mile to create some added content. First off is a commentary tracks, one with director Michael Owen Morris and script editor Eric Seward moderated by Toby Hadoke. This track, lacking the participation of any of the actors, was a bit dry. 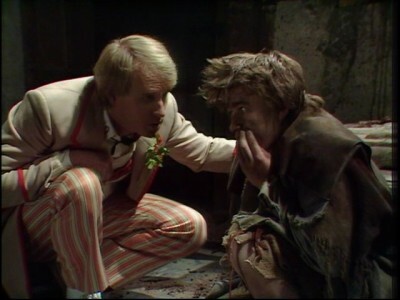 It didn't have the humor and energy that's present on a lot of the other Doctor Who commentary tracks. They talk about the locations and shooting, and discuss how this serial differs from the new Doctor Who. Overall, it was okay, but you won't miss a lot if you skip it. That's followed by a trio of featuettes. Return to Little Hodcombe (19 minutes) is a making-of piece where they interview the crew as well as some of the natives from the villages where this story was recorded. It's a fun bit, especially seeing some of the pictures with the cast posing with the locals. Making the Malus (7 min) is a short bit on how the main villain of the piece was created. 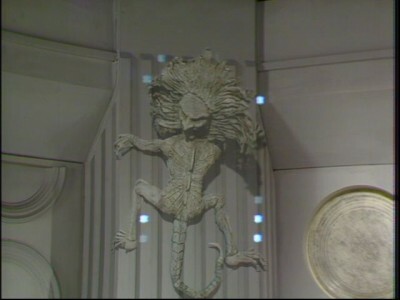 They managed to track down the prop face, which was in surprisingly good condition, in a private collection and had the creators describe how the created the medieval demonic being. Now and Then (7 min) revisits the shooting locations to see how little they've changed. In addition to that there are nine minutes worth of deleted scenes (including a piece with Kamelion) and a clip from the Golden Egg Awards where Doctor Who is honored for an outtake that's not really all that funny. The story also comes with an optional pop up trivia tracks that's filled with information. Some of it is minutia, the date the episodes were filmed and ever the time that the shoots wrapped, but also background info on the supporting and incidental characters and it points out on screen gaffs. These are wonderful. There's also a photo gallery, the Radio Times listings (in .pdf format) and an isolated music track. This is a decent story hampered only by the fact that several plot points were trimmed when they reduced the story from four episodes to two. There is something nice about these short two-parters that occurred during Davison's tenure, they're simple and to the point and can be a lot of fun as long as you don't analyze them too closely. Recommended.